Treatment of small ants varies according to the specie. One step that is common to all species, however, is that the best treatment requires knowing the location of the colony. Fortunately, this isn't that difficult to do. Most ants are foragers. In some species, they may travel hundreds of feet from their nests to find food. That's why the place where you see the ants may not necessarily be the place you want to treat. In many cases, the small ants you see in your home actually live outside and only come into your house for food. So one aspect of ant control (and pest control in general) is to eliminate food sources as much as possible. This means promptly washing dishes, cleaning up spilled food, and securing stored foods in insect-proof containers. 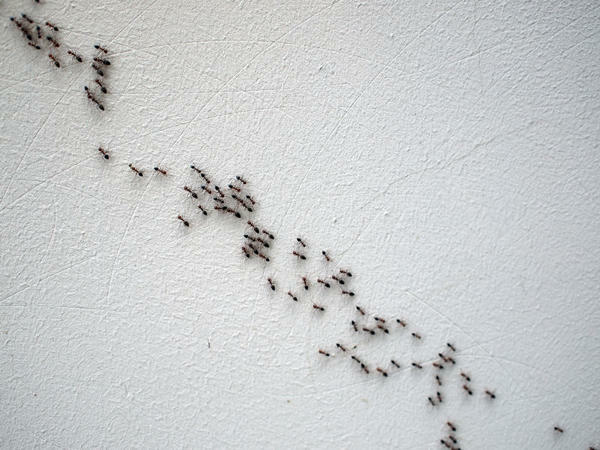 The most common way to locate an ant colony is to simply follow the ants. You may be seeing them on your kitchen counter, but they may actually live hundreds of feet away. So choose a few ants and follow them. In particular, look for ants who are carrying little bits of food, because they're the ones who are returning to the nest. If you have young children, ask them to find out where the ants live. Children often are fascinated by things like insects, and there's a good chance they already know where the nest is. If you determine that the ant nest is outside, then very possibly you won't need to treat inside the house at all. Most exterior ant treatments use granular ant baits for effective control. Some of the better ones for small ants include Niban, Terro, MaxForce, and Advance. When using granular baits, try to apply them when the weather forecast is dry for the next few days. Most baits are no longer attractive to ants or are less effective at killing them once they've gotten wet. And of course, be sure to read and follow the label directions. In previous versions of this site, I had a long list of ants with specific instructions for identification and control. The problem with that approach was that most folks still couldn't identify the ants from the information provided. The differences is species are just too subtle; and trying to include enough taxonomic information for people to make a positive identification was simply beyond the scope of a DIY site. So I'm trying a new tack. The best way to kill small ants is with bait; and when using baits to kill ants, the only thing that really matters is whether the ants like the bait that you're presenting. Basically, that comes down to a choice between sugar-based baits, and fat/protein-based baits. Each ant specie has its own preferences, which may change at different times of the year as the colony is involved in different work (reproducing, preparing for the winter, etc.). Understanding those cycles might make for a nice entomology project; but if what you want is to kill the ants, not to know them intimately, then all you need to know is what your particular ants want to eat now. All of the over-the-counter exterior ant baits are palatable to a wide variety of ants, and all of the exterior sprays (if you decide to go that route) are lethal to a wide variety of ants. So really, all that's left is determining what baits to use inside your home, if exterior baiting doesn't solve the problem. That's a lot easier to do than looking at ants under microscopes. The great majority of small ant colonies actually are located outside the home, so the trick is to place a granular bait in between your home and the ant colony. If you're not sure exactly where the colony is, then you can simply spread bait around the entire house. In almost all cases, treating the exterior of your home with bait is a better idea than using sprays because baits usually result in the eventual death of the colony. The baits are slow-acting, so the ants who find them will survive long enough to carry them back to the nest, where they will be fed to other ants, resulting in the eventual elimination of the colony. This may take a few days to a few weeks; but in the meantime, you should see fewer ants inside your home because once they find the bait outside your home, they usually won't bother going inside your home. There are many excellent exterior ant baits. Some of my favorites are Niban, Terro, MaxForce, and Advance 375A. In general, if the ants are taking sugars and carbohydrates, I usually use Niban or Terro because I prefer using borates when I can. If they're strongly going for fats and proteins and ignoring carbohydrates, then I use Maxforce or Advance 375A. They're much better-accepted during ants' fat and protein feeding cycles. After treating the outside of your home, I suggest waiting at least a few days before treating the inside. There's a good chance that you won't need to. But if you do, I suggest you use a liquid, gel, or granular bait, or ant bait stations, as close to the ants' entry point as you can (or as close to their nest as you can if they're nesting inside your home). Again, choose a bait appropriate to the ants' feeding cycle preference. 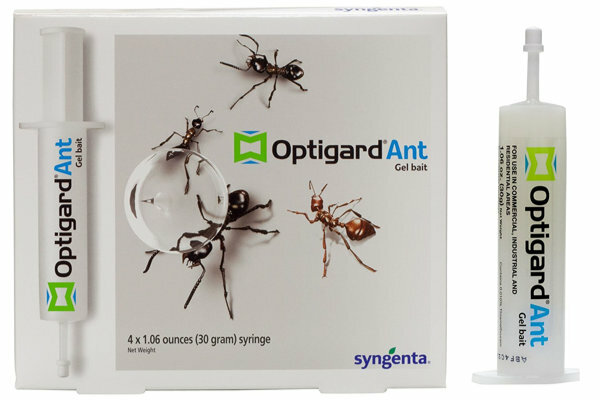 During sugar-feeding cycles, I like using Terro Liquid Ant Bait, Advion Ant Gel Bait, or Optigard Ant Gel Bait. During grease / protein feeding cycles, Advion Ant Bait Arena bait stations seem to work very well. During periods of mixed feeding (or if you're not sure what the ants are eating), InVict AB Insect Paste is a good choice. It contains multiple attractants and is fairly well-accepted by ants (and many other insects) during all feeding cycles. I'm not a big believer in exterior spraying for ants because baits usually work a lot better. But there are two cases where spraying makes sense. The first is if the ants simply aren't taking the bait; and the second is if you're also having problems with pests like pillbugs, sowbugs, or spiders who don't readily take baits. If you decide to spray the exterior of your home to create a "chemical barrier" around it, then don't use baits. Most sprays are repellant, and baits are attractants. Using both together makes no sense. Instead, use a broad-spectrum liquid insecticide like Ortho Home Defense or Harris Home Insect Killer. If you want a more natural product, I've read good things about Wondercide Outdoor Pest Control spray, but I haven't personally tried it.